I was sent Miss Melicious Cupcakes recipe book to review by Penguin Books and the sub title reads quirky delicious treats to bake at home. 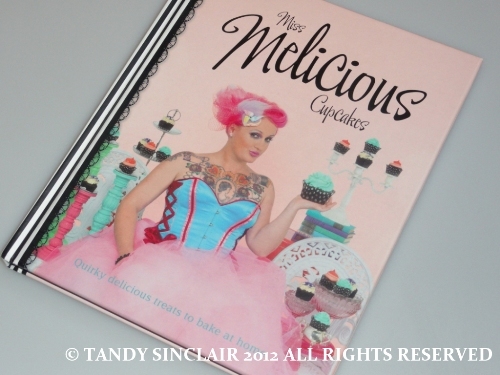 The book contains 41 cupcake recipes of those sold in the boutique cupcakery and tea shop with the same name. 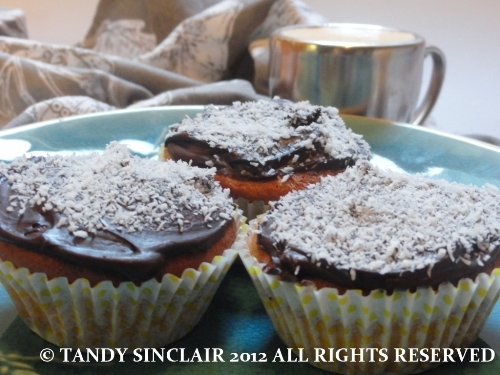 The tea shop is situated in Auckland and I decided to make the lamington cupcakes as my first tester. These are described as a kiwi classic. I normally halve a recipe when testing it, as I substitute the sugar for fructose and I am never sure how that will work out. However, this recipe said it would make 12 cupcakes and halving it did not seem worthwhile. I made 12 cupcakes and a loaf cake! I absolutely loved the citrus flavour of the cupcake, and the chocolate ganache topping with desiccated coconut finished it off perfectly. I baked the cupcakes. The preparation time was 25 minutes including squeezing my own grapefruit juice. Warning – when you mix grapefruit juice to milk it sort of curdles so when you add it to the mixture it looks split but when you add the dry ingredients it pulls it back. Had to bake for 28 minutes and they are still a bit moist inside – not the kind of moist that makes a cake lekker but more like gooey moist. Taste delish but they fall apart. Not sure if one could serve them out of the cupcake cases and some of them have pulled away from the case – or the case has pulled away from the cupcake. Made 18. 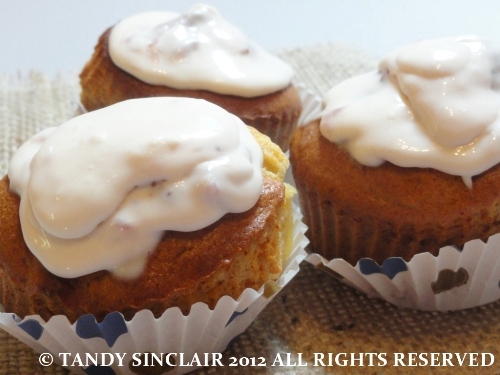 The second recipe I tested was for the strawberry shortcake berrylicious treat. I halved the recipe as I did not want a dozen cupcakes, and the recipe made 6 and was easy to follow and the preparation time was as long as it took for my oven to preheat to 180° Celsius. I did not use my cupcake tin, instead I used silicone cupcake holders and they worked really well, with the cupcake coming out with ease. They baked perfectly in 15 minutes so this is a recipe you can put together at short notice. They have a lovely texture and taste. The strawberry comes from the strawberry jam butter cream, but I chose to top them off with some double thick cream through which I stirred my homemade strawberry jam. It was absolutely delicious! There is also a vegan cupcake and vanilla bluffer cream recipe in the book so if any of my vegan / vegetarian friends out there are willing to try the recipe, please let me know. The book includes recipes for various butter creams, frostings, decorations, cookies, chocolate ganaches, chocolate fudgy filling, fried bananas, a glaze, a mousse, candied bacon bits and marshmallow fluff. Disclosure: I received this recipe book free of charge. I have not been paid to write this review, nor was a blog post requested of me. This post is in line with my blogging policy. How fun – I toyed with the idea of a book of just cupcakes. Sounds like loads of fun things to try. Those are tasty looking cupcakes! Hi Tandy, i will have to look out for this book, as you mention it has a vegan recipe. I just noticed that some of the images in your Blog footer isn’t loading in Google Chrome. I don’t know if anyone else has the same problem. I refreshed the page and opened it in a new Browser. They are loading in Mozilla, but not in IE either. It’s strange, I don’t know what one can do about it. The footer looks very differen in IE. Your mom sounds like a star!